Barley and wheat malts, six kinds of hops: flowery aromas on a golden beer. 75cl bottle. Hazy yellow / golden with a medium white soapy head. Medium body with moderate carbonation. Tasty IPA! Hazy golden color. It has a malty aroma, some hop, earthy. Good caramel flavor, in a medium body, with good hopping and a touch of pepper. The bitterness is well balanced, well mixed with the caramel, and it’s improving at the end. Truly IPA for me, very good. Fully opaque orange; small but persistent yellow head. Very lemony nose with obvious hoparoma’s, but in all not very outspoken. Immediate hopbite, quite bitter, dry, grapey & slightly dusty. Zesty finish, flowery. Bitterness diminishes gradually in intensity. Not very well-bodied, light, slight slickness, but not empty. 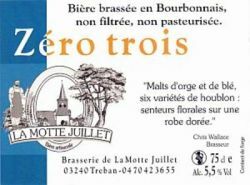 Another hopblast from La Motte-Juillet. But I seem to detect a certain "déjà-goûté", like a theme that is varied upone a bit too often. La Motte-Juillet is without doubt, the most American of French breweries.